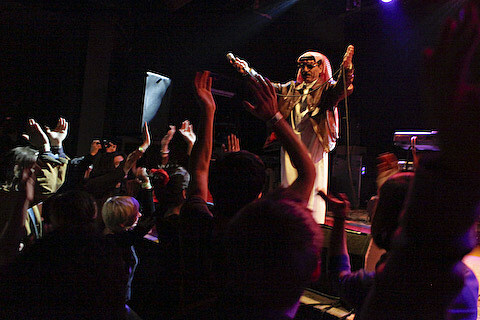 Syrian musician Omar Souleyman is returning to the states this summer and has added a June 12th show at Music Hall of Williamsburg with Ali Shaker. That NYC gig is in addition to previously announced dates at Bonnaroo, Chaos in Tejas and the Winnipeg Folk Festival. Tickets to the Brooklyn show go on AmEx presale Wednesday morning, and then on general sale Friday (4/15). In related news, Austin festival Chaos In Tejas has made some major moves recently, adding Baroness, Citizens Arrest, Crystal Antlers, The Donkeys, Burning Love, and Trap Them to the fold and losing one band, Low Threat Profile. 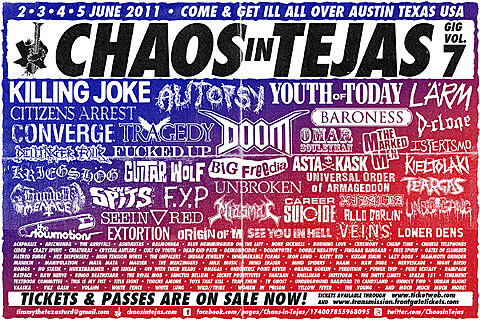 To pick up tickets for individual shows or a pass for the whole event, head to the Chaos in Tejas page. Chaos in Tejas is one of the stops on the Converge/Burning Love/Trap Them tour which hits Santos on May 25th. Tickets for the NYC show are on sale. Current Chaos in Tejas flyer, all set times, and all Souleyman tour dates are below. Yes, the ticket from Emo’s and use it at Red7!